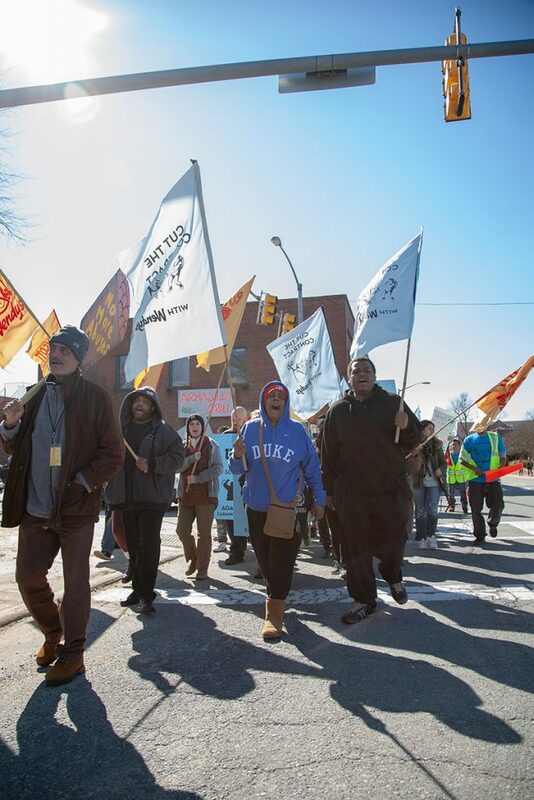 Colorful, joyous March for Farmworker Justice overtakes the streets of Carrboro, Chapel Hill! 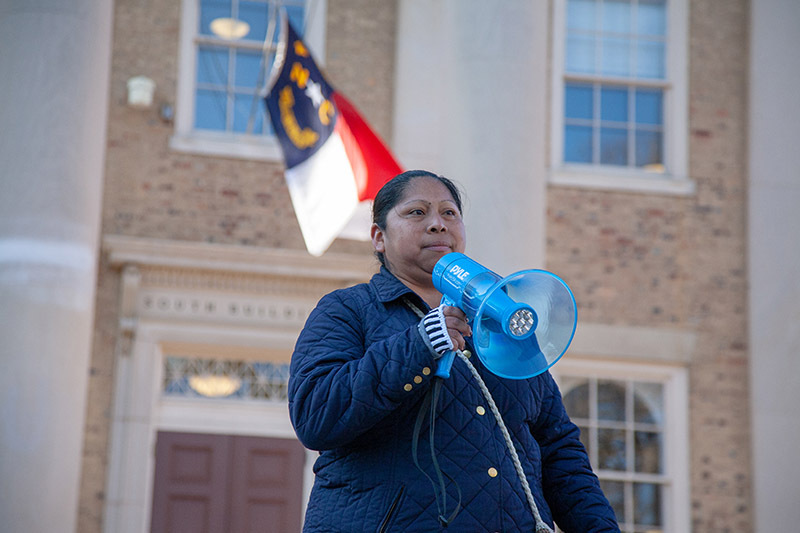 On Tuesday afternoon, nearly 250 people gathered across from the much-beloved Weaver St. Market in Carrboro, North Carolina, for the March for Farmworker Justice to the University of North Carolina in Chapel Hill, demanding that UNC Interim Chancellor Kevin Guskiewicz cut the university’s contract with Wendy’s. 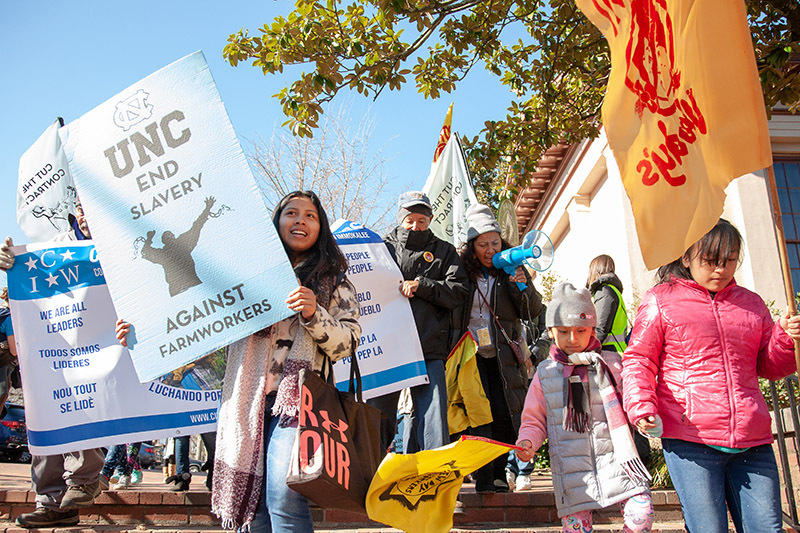 As the first major action of the 4 for Fair Food Tour, large and high-spirited groups representing congregations, schools, and communities from across the Triangle Area poured into the streets, waving their flags, banners and signs and marching alongside farmworkers to the heart of UNC’s campus. 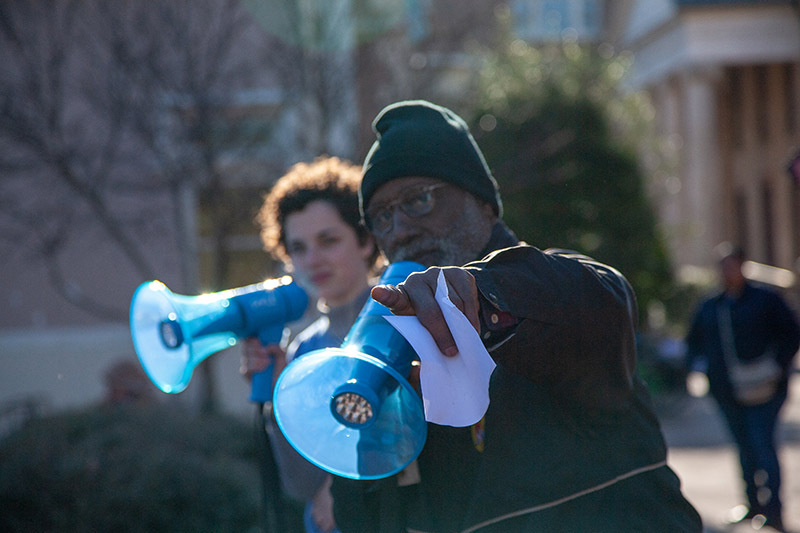 The two-mile march came to a resounding close with a rally on the doorstep of the UNC administration, featuring speakers including Kerry Kennedy of the Robert F. Kennedy Human Rights, T’ruah Rabbi Eric Solomon from the Beth Meyer Synogogue, UNC student leaders, the NAACP, the Fight for $15, and of course, the Coalition of Immokalee Workers! 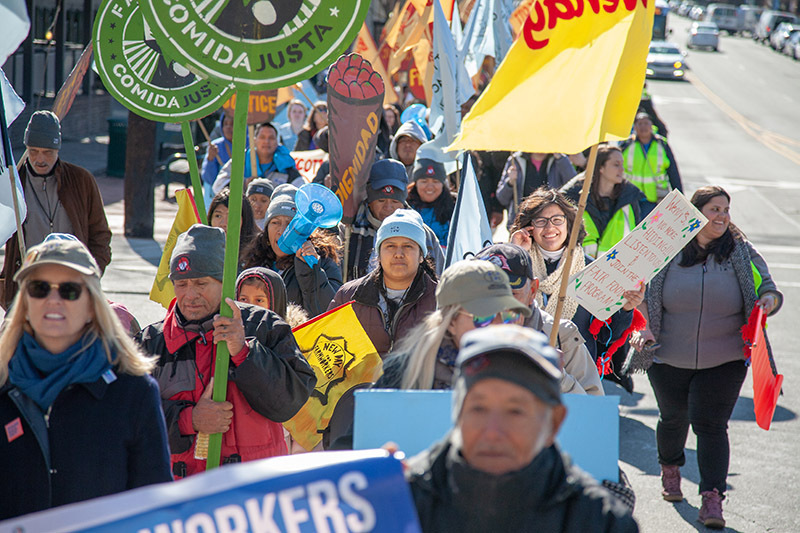 Today, we bring you a video and photo report from the day’s beautiful protest, which kicked off what is sure to be a series of powerful actions in the national Boot the Braids Campaign from Ohio to Florida. 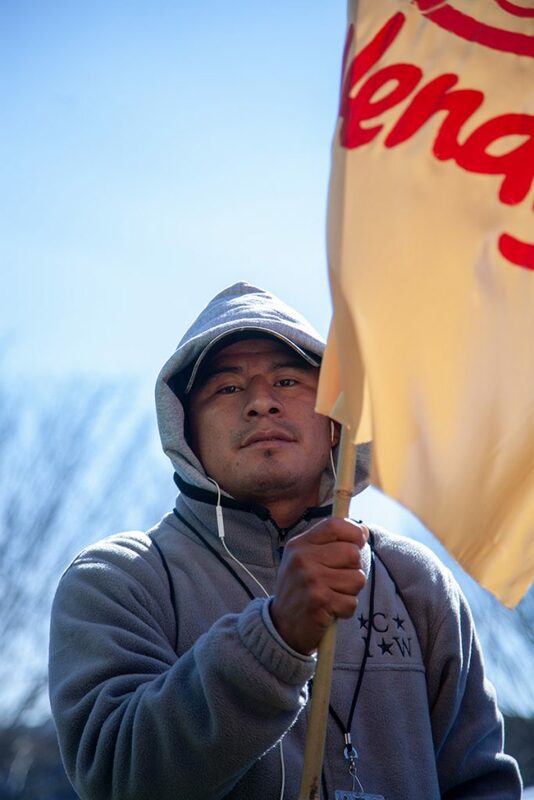 Farmworkers from Immokalee and their allies started the day saying goodbye to New Hope Camp; organizing artwork, duffel bags, and sleeping rolls once again for the long road trip to Ohio following the day’s action; and flyering students on campus for the upcoming march and rally. As the old saying goes, an army marches on its stomach, and it is no different with the Fair Food army. 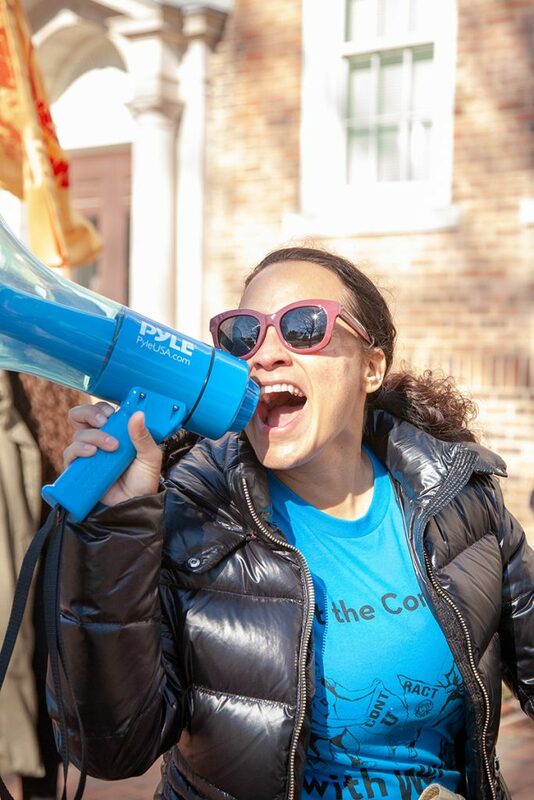 So with lunchtime fast upon them and the march looming, the tour crew turned, as always when in North Carolina, to the one and only Vimala from Vimala’s Curryblossom Cafe. 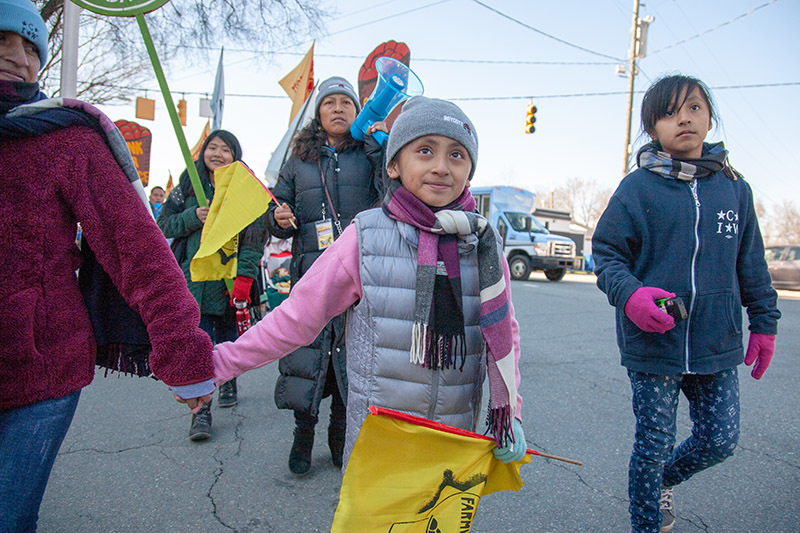 Fueled with a warm and hearty lunch, the crew from Immokalee and their local allies grabbed their artwork and readied to march the two miles from downtown Carrboro to the South Building on the campus of UNC, where the university administration offices are housed. 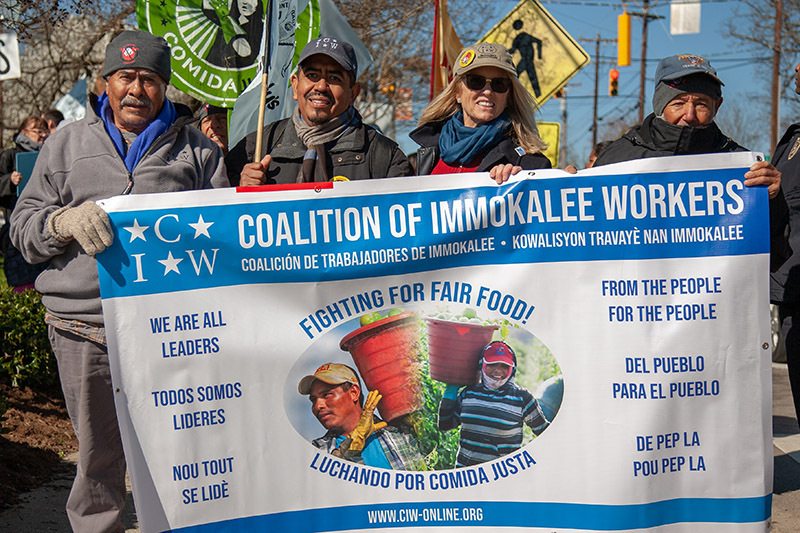 As has been so often the case for nearly two decades now, farmworkers from Immokalee at the head of the march were joined by Kerry Kennedy, Executive Director of the Robert F. Kennedy Human Rights center and one of the CIW’s most faithful allies. 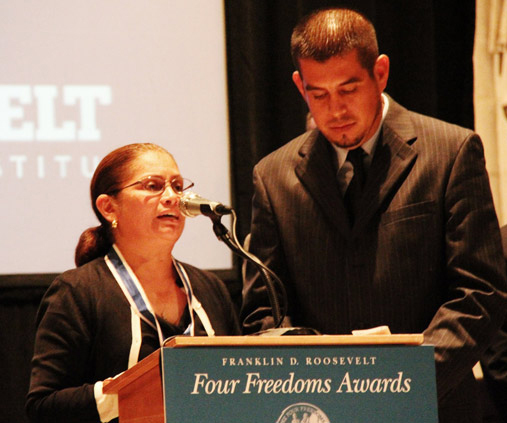 … who were followed by an impressive array of local organizations and leaders. 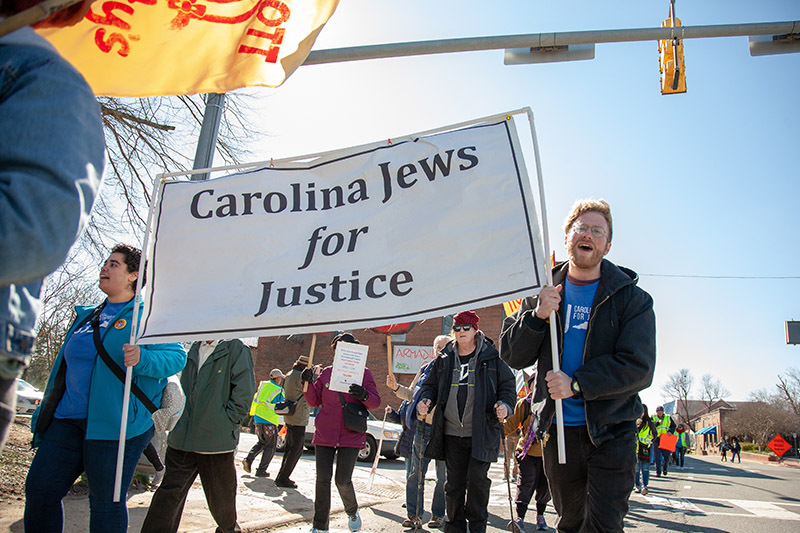 After the march received the blessing of Pastor David Mateo of the United Church of Chapel Hill, farmworkers were joined by other members of the United Church of Chapel Hill; a contingent from the Durham Fight for $15; Carolina Jews for Justice; the National Domestic Workers Alliance; the North Carolina Poor People’s Campaign; the Durham Workers Assembly; UE Local 150 NC Public Service Workers Union; Acción Politica Latina, who also helped make sure CIW was well-fed during their stay in Chapel Hill; Students United for Immigrant Equality; Student Action with Farmworkers; the Church of Reconciliation, who had hosted CIW for a beautiful gathering on Monday evening; the Executive Director of the National Farmworker Ministry, Julie Taylor; and the Director of the Catholic Labor Network, Clayton Sinyai; Triangle Friends of Farmworkers; Representatives from the Town of Carrboro Board of Aldermen; Church of the Advocate; Chapel Hill – Carrboro NAACP; Church Women United; University United Methodist Church (Chapel Hill); Kehillah Synagogue; The Raging Grannies; Farm Stewardship Association; University Presbyterian Church – Chapel Hill; Vegans for Peace; United Church of Chapel Hill; the Workers Union at UNC; Representatives of the Presbyterian Church (USA)… and of course, dozens of students and faculty from not only UNC Chapel Hill, but also Duke University and Duke Divinity. 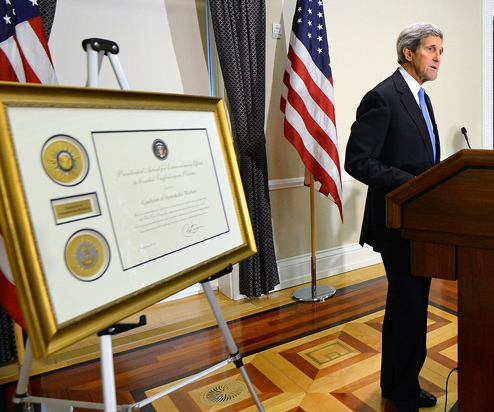 … and, of course, scores of students from the University of North Carolina Chapel Hill. 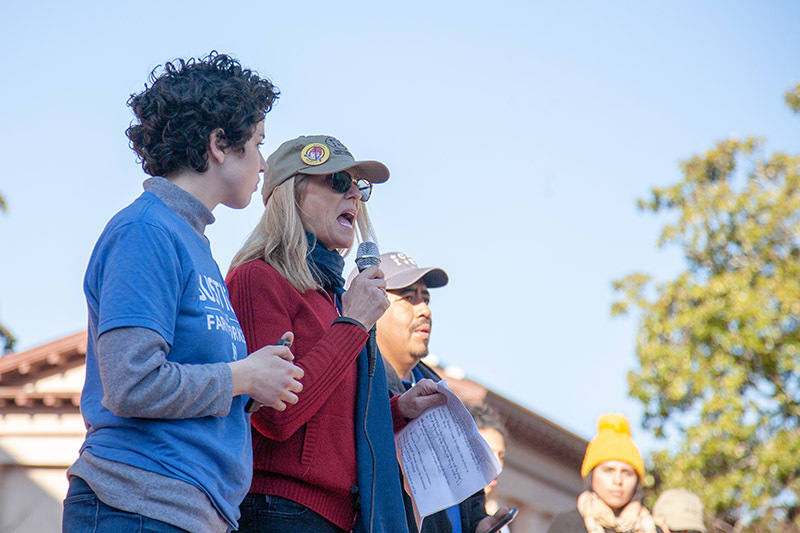 As the march reached the end of its city route and turned into the rolling campus of the University of North Carolina itself, the ánimo team was in top form, leading the hundreds of marchers in chants that echoed across the wide lawns and old brick buildings. 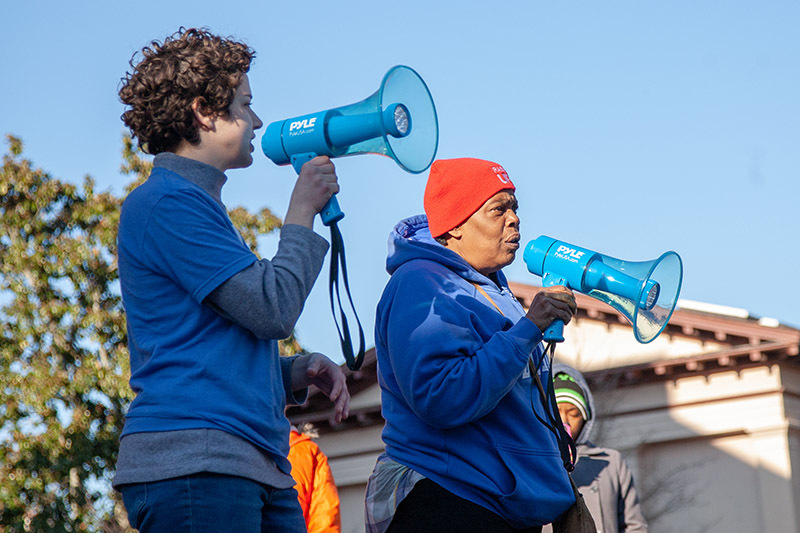 … in order to squeeze in a massive picket, for good measure, before heading back up to the South Building, where administrators heard the marchers’ calls of “Boycott Wendy’s” drawing ever nearer. 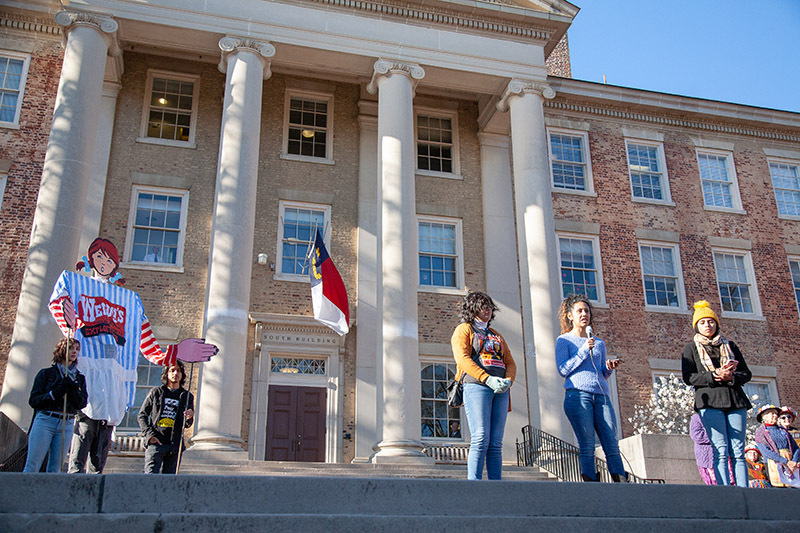 Once there, the marchers gathered for a rousing rally on the steps of the administration building, sending an unequivocal message to UNC’s leaders: The days of debating and offering disingenuous excuses to avoid taking action are over. 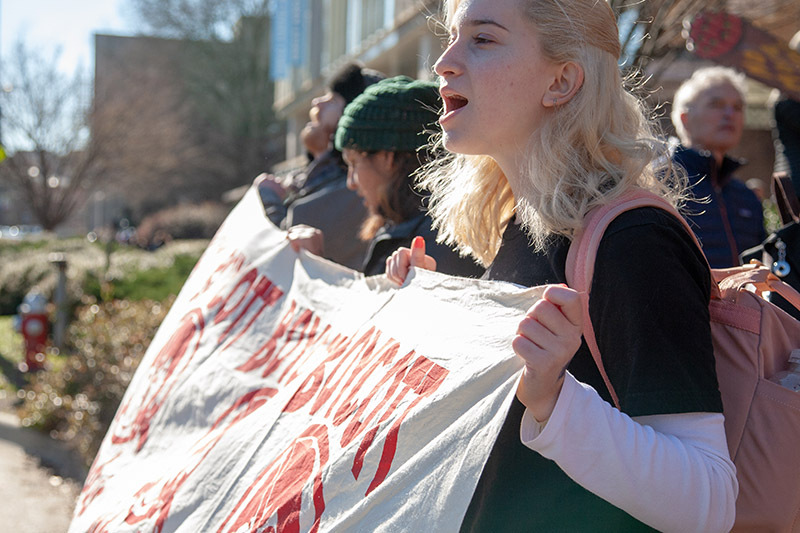 It is time to make a decision about whether or not the country’s first public university will be on the right side of history by cutting its business ties with a company as morally compromised as Wendy’s, and live up to its motto of “light and liberty”. 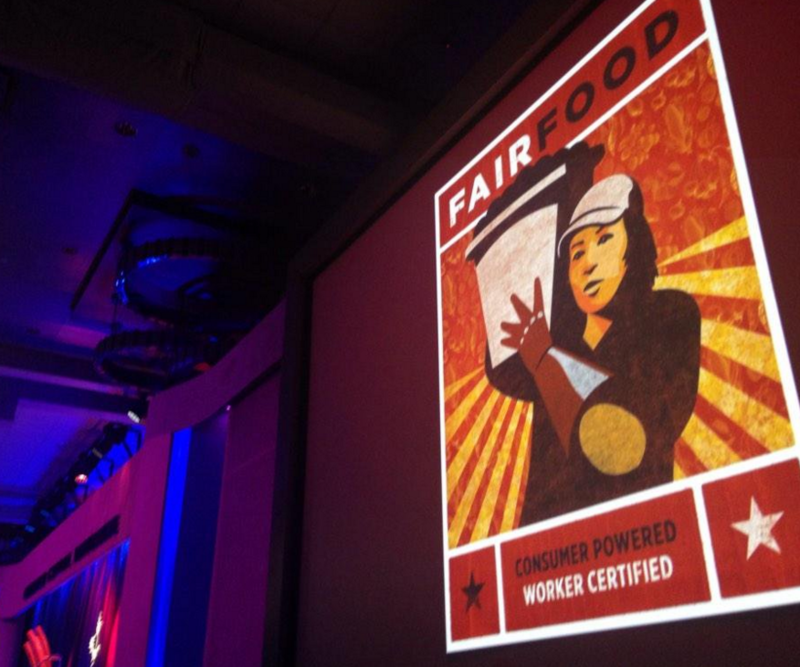 The rally, which was co-emceed by CIW’s Lucas Benitez and the Alliance for Fair Food’s Rev. 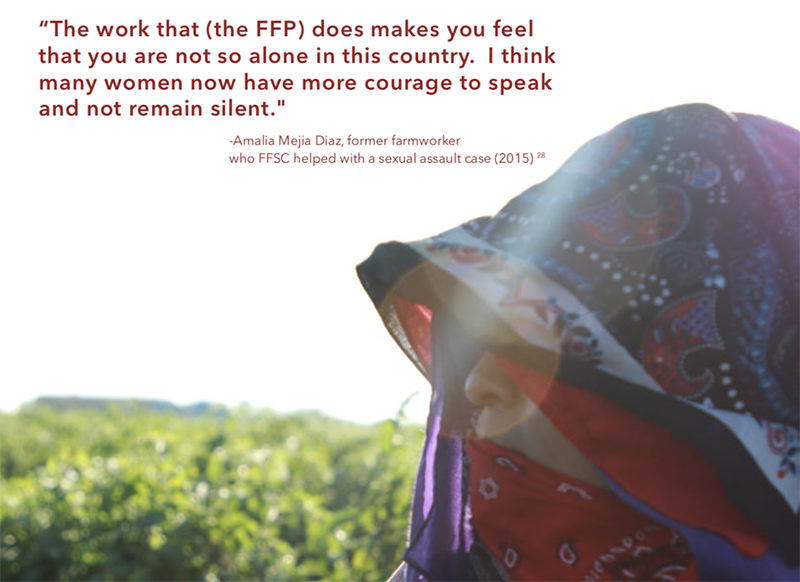 Noelle Damico, began with a powerful speech of remembrance from Kerry Kennedy, who recalled the long history of solidarity between farmworkers and consumers across the country, from her father’s days of standing with the United Farm Workers in the 1960s to today’s nationwide Fair Food Movement. 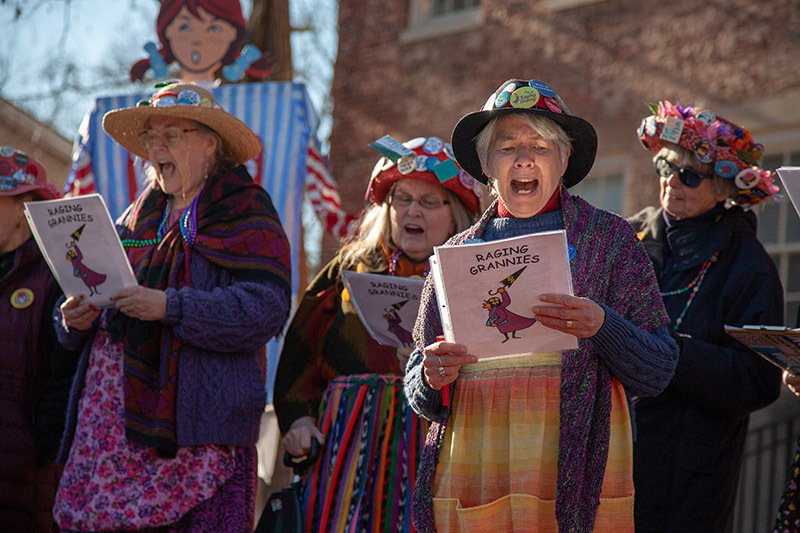 The crowd was treated with an interlude from the Raging Grannies, who performed original, Wendy’s Boycott-themed songs, much to the delight of the cheering farmworkers and students at the foot of the steps. 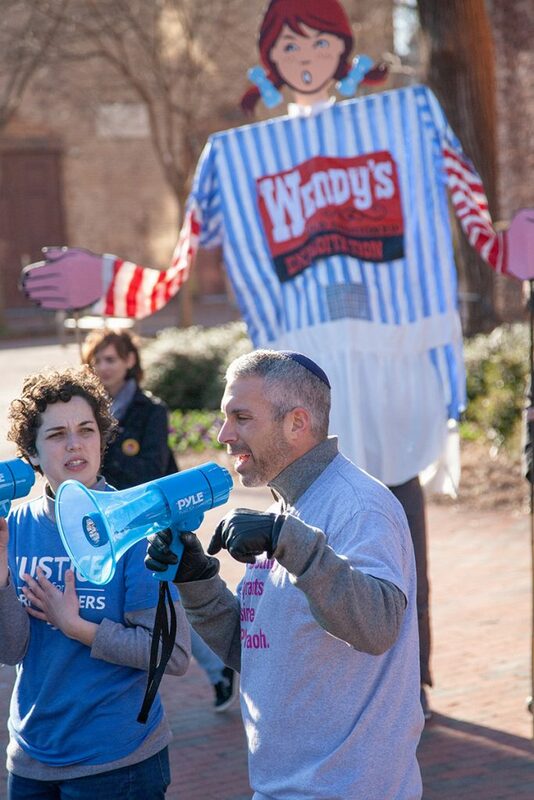 The power of the faith community’s commitment to Fair Food was captured in the remarks that followed by Tomato Rabbi Eric Solomon from Beth Meyer Synagogue in Raleigh, who demanded an answer from both Wendy’s and UNC to a fundamental question: Where is your conscience? 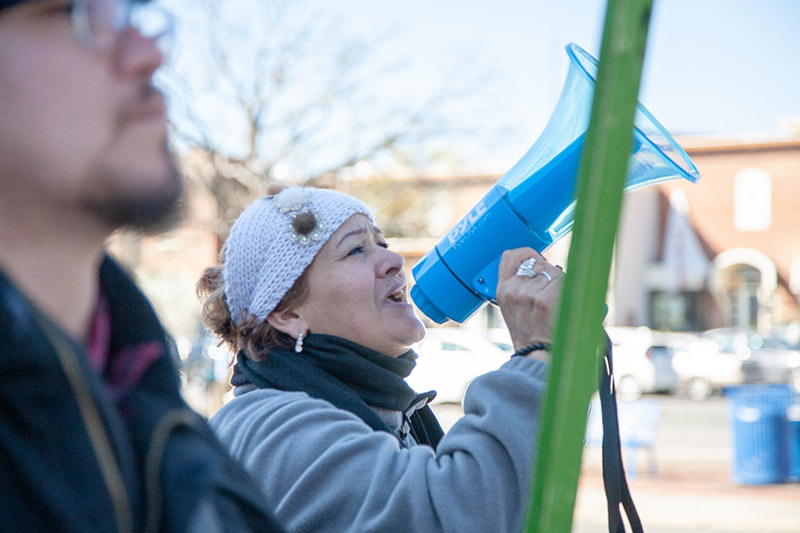 … as well as the Fight for $15’s Bertha Bradley – a Wendy’s worker herself – who connected the dots on the shared struggles of farmworkers and fast food workers alike. 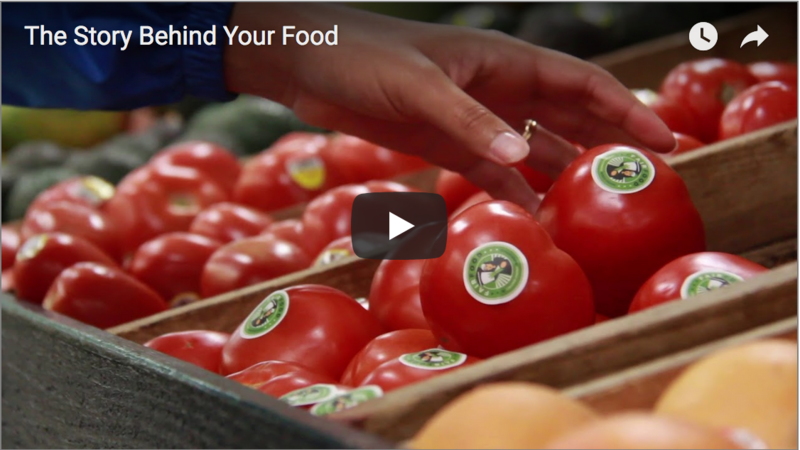 And that is a wrap for the first major action during the 4 for Fair Food Tour! 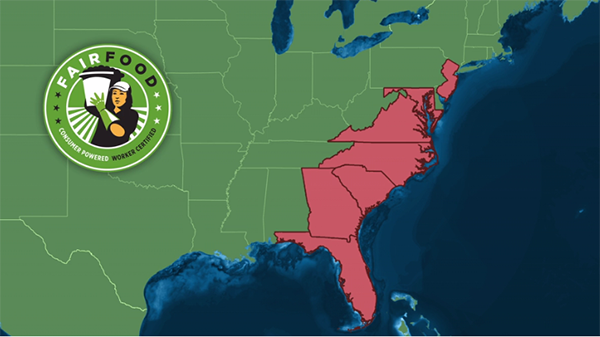 Now, the tour crew is headed to Columbus, Ohio, the heart of Wendy’s territory, to carry the momentum at UNC over to Ohio’s flagship institution: Ohio State University… stay tuned! 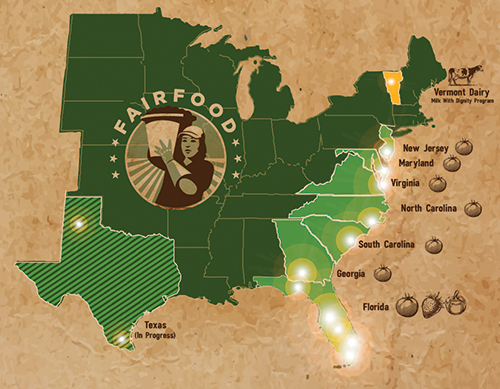 Day 2 of the 4 for Fair Food Tour builds momentum with powerful support from North Carolina’s communities of faith!